Hopefully you can help me figure out what is wrong. (in /initrd) ...note, /mnt/home is a link to it. Try to load the extra sfs's via the Boot Manager under System in the menu. No change, I continue to have to load the sfs files. 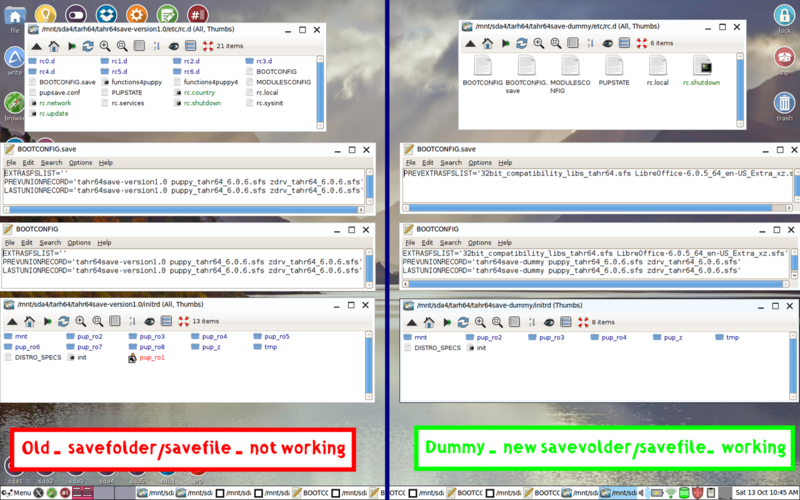 The dummy test file works fine, in other words, I do not have to load my sfs files on every time I need to start puppy when using the new savefolder. Now we need to figure out what is wrong or missing in the old save. Boot not using the old save. Navigate to the old save and left click on it to show what is in it. Navigate to the /etc/rc.d directory in the old save. Should be two files in it that should have info on sfs loading. Notice they have info about the sfs's to load. If there is no info these files are bad in the old save. Try replacing them with the good ones in the new save. The question is still there. Why in the old save, these files are not getting updated and saved with the changes. You can add the above command to the /etc/rc.d/rc.local file. You can add the path and names of all those sfs's you want to load next to each other in the same command. Thank you, nicoo7! How did you find out that command? And, if loading more than one, how to say it? Separate with spaces, or commas, ..? And thanks to bigpup re the files to check. To unload, add -u as an option. During the first boot after replacing the BOOTCONFIG and BOOTCONFIG.save from the old savefolder (not working) with new files from the dummy (working) savefolder, the sfses listed on those files are loaded, however, after the first reboot the same problem occurs, NO sfs are loaded again. In the old save that is not working correctly. There is a pupsave.conf file. Can you post what is in it. Not sure why you have this in old save. It is not in my save for an install of Tahrpup64 6.0.6. Try moving the pupsave.conf file out of the save so it is not there. Any help using the old save? In the old save you probably have programs you installed. Are you by any chance using some shutdown control program you installed? Like Pupshutdown. Something other than what is in Tahrpup. I removed it, apparently nothing changed. drwxr-xr-x 9 root 4096 Oct 13 13:49 .
drwxr-xr-x 44 root 4096 Oct 14 2018 ..
Something seems to be deleting the info in the BOOTCONFIG file. Boot using the old save. In a console run this command. Maybe it will show some error. It will show something like this if it is working correctly.